Wishes:As expressions of sympathy in Edna’s memory, donations may be made to a charity of the donor’s choice. 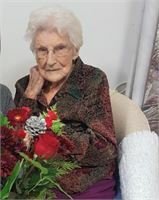 Edna Violet (Carter) Silliker, of the Miramichi Senior Citizens Home and formerly of Millerton, NB, wife of the late Walter Silliker, passed away at the Miramichi Senior Citizens Home on Tuesday, January 29, 2019 at the age of 98. Born in Millerton, NB, she was the daughter of the late James and Mary (Murray) Carter. She was a member of the Grace Presbyterian Church in Millerton. Edna is survived by two children: Lunn Silliker of Miramichi, NB and Linda Keirstead (Garvin) of Ottawa, ON; four grandchildren: Kimberley Wilson (Doug) of Ottawa, ON, Kerry Crouchman of Ottawa, ON, Krista Silliker (Joseph) of Saint John, NB, Corey Silliker of Miramichi, NB and Kanda Laurin of Miramichi, NB; eleven great grandchildren: Abigail, Aidan, Gage, Joel, Brandon, Darby, Tyra, Rylee, Averie, Alexander, Raya, as well as several nieces and nephews. Besides her parents, and husband Walter, she is predeceased by sisters: Ruby Cloutier, Marjorie Jones, Pearl Russell, Lilla Somers and brothers: Allan, Edison, Lunn, Rett. Visitation will be held at Bell’s Funeral Home, 651 King George Highway, Miramichi, NB, on Sunday from 2-4 PM only. Funeral service will be held from The Sterling Bell Memorial Chapel, 651 King George Highway, Miramichi, NB, on Monday, February 4, 2019 at 11 AM with Rev. Perry Cooper officiating. Burial will be in Miramichi Cemetery later in the spring. As expressions of sympathy in Edna’s memory, donations may be made to a charity of the donor’s choice.